When Caroline Julia Bartlett was born in the village of Hudson, Wisconsin, in 1858, there was no denying her birthright claim to the title of pioneer. But she was a pioneer in more senses than the temporal-geographic alone: Caroline was an early American feminist, civic leader, social reformer, minister, as well as a nationally recognized authority on city sanitation. She was also a daughter, sister, wife, and mother. Julia and Lorenzo Bartlett welcomed their first baby, a little girl, into this world just over a year after their March 1849 wedding; a second daughter followed not long after. By Julia’s eighteenth birthday, she was the mother of two young daughters. By her nineteenth birthday, both of Julia’s daughters would die from separate illnesses, and she and Lorenzo would face the sadness of burying them. The young parents, Julia and Lorenzo, were devastated, and the pain of their loss remained raw for the rest of their lives. According to Caroline, neither of her parents was ever able to speak of the two older sisters who she never met, but she felt the impact of their deaths most acutely in her parents’ forever-altered relationship with religion. Julia and Lorenzo had grown less certain in their faith. After several years without children in their home, in August of 1858 Julia gave birth to Caroline. Two years later, in 1860, the Bartletts’ last baby and only son, Charles Lorenzo, was born. Caroline and Charles shared a close relationship throughout their lives. As children, Caroline and her brother absorbed their parents’ religious ambivalence, all while faithfully attending the local Congregational Sunday School. Caroline recalls asking earnest questions of her instructors, which “were always dismissed with something like a kind rebuke.”2 In spite of such dismissals, her curiosity blossomed. In 1874, when Caroline was 16 years old, she had her first encounter with Unitarianism. At the time, her family was living in Hamilton, Illinois, and a Unitarian preacher from Keokuk, Iowa, preached in their local city hall. He awoke something inside Caroline, and within hours of hearing him speak, she declared to her father her ambition to become a Unitarian minister. And so began the journey that would eventually lead Caroline to Kalamazoo, Michigan. 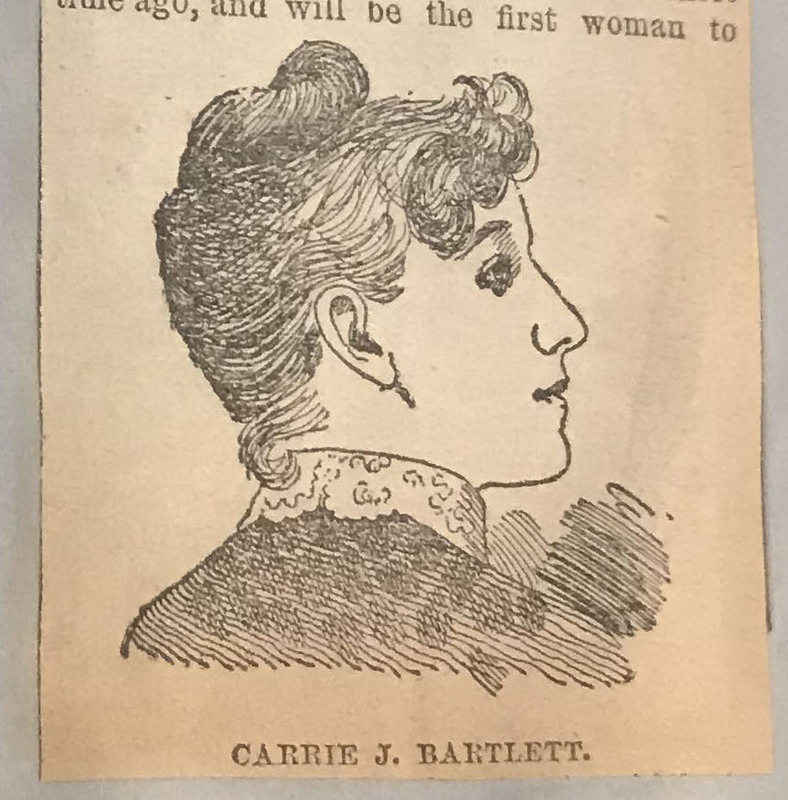 In the fall of 1879, 21-year-old Caroline graduated as valedictorian from Carthage College in Kenosha, Wisconsin. Her aspirations to pursue graduate study in theology were slowed because of her financial situation. Without the funds necessary to immediately continue her education, Caroline determined that her best option was to work until she had saved enough money for tuition and expenses. 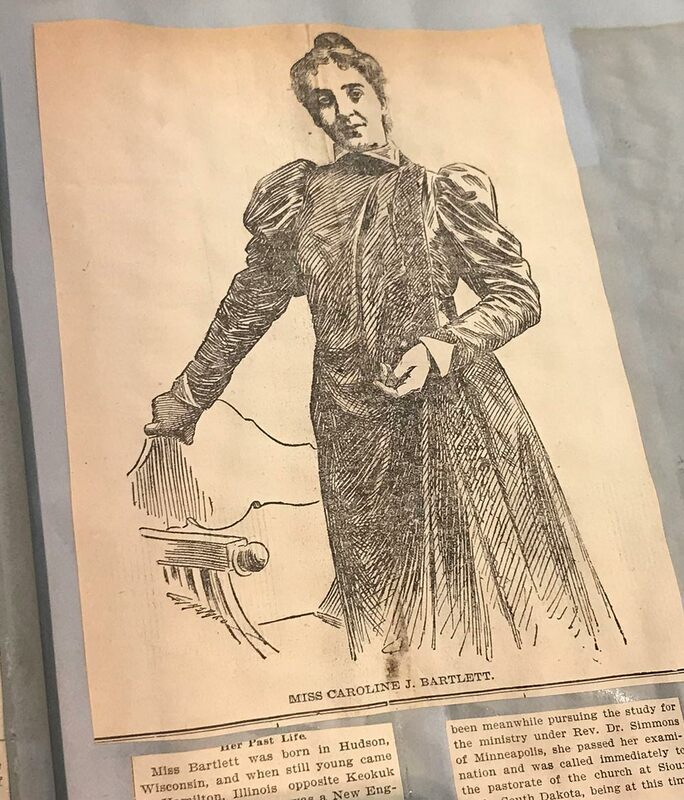 Her next job was as city editor of the Oshkosh Morning Times in Oshkosh, Wisconsin, where her contemporaries included the journalists Charles Edward Russell and Albert Shaw; she shared a lifelong correspondence with the latter. In 1885, Caroline landed an interview with the great American author Mark Twain, whose second book, Adventures of Huckleberry Finn, was released that same year. In 1886, Caroline applied for, and the Iowa State Unitarian Conference accepted her, “as a candidate for the ministry,” and the following year she was called to lead a recently-established congregation in Sioux Falls, South Dakota.4 Caroline’s intentions had been to pursue, in modern parlance, an experiential education - to study ministerial texts and the Bible at the same time that she led the small congregation. But under her leadership the small congregation grew threefold in just two years, and as a result, Caroline found herself without the time she had expected and needed for her studies. Formally educated or not, Caroline was beginning to establish a reputation as a gifted minister. Before long, in 1889, the leadership of the Western Unitarian Conference urged Caroline to resign her position in Sioux Falls in order to “resurrect what seemed a dead movement” at the First Unitarian Church in Kalamazoo, Michigan.5 The Kalamazoo church, established in 1858, had suffered a divisive quarrel four years earlier and had not hosted a single service since. Caroline was promptly ordained. As Kalamazoo’s newest minister, she set to work addressing the multitude of social issues affecting her congregation and city residents in general. She “promoted a seven-day church with social programs for all people, regardless of race, color or creed,” and successfully persuaded her congregation to become nonsectarian and take on a new name, the People’s Church. On December 31st, 1897, 37-year-old Caroline married a local man ten years her junior, Dr. Augustus Warren Crane, a remarkable innovator in the emerging fields of radiology and radiography (x-rays). 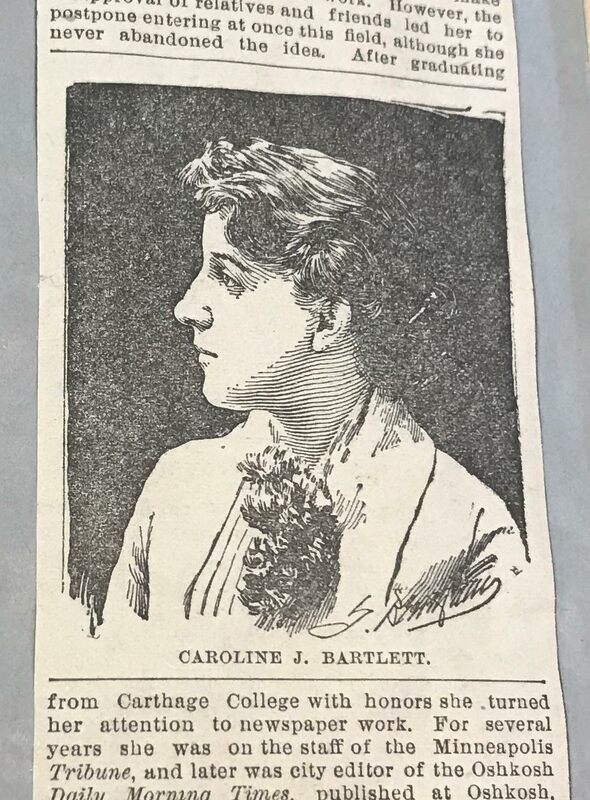 In 1898, Caroline resigned the pulpit in order to devote herself fulltime to her work as a civic leader and social reformer. Among her chief concerns were treatment of the poor and public sanitation. A year before Upton Sinclair’s novel-turned-expose on the meatpacking industry, The Jungle, was published, in March 1903 Caroline joined forces with Battle Creek businessman and physician, Dr. John Harvey Kellogg, to address state legislators regarding the widespread consumption of diseased meat in Michigan and “to urge the passage of a rigid meat inspection bill.”9 The bill - Caroline’s bill - passed two months later and had an almost immediate impact. Within a year, other states across the nation would begin adopting similar legislation based directly on the Michigan bill. Caroline’s investigations and knack for achieving results convinced her of the need for a unified effort to tackle the full range of sanitation issues facing Kalamazoo. In November 1903, Caroline made two addresses, one to the Ladies Library Association and the other to the Twentieth Century Club, “inviting them to cooperate with me in organizing a Women’s Civic Improvement League, to see what we could do for the greater order, cleanliness, and sanitation of our city.”10 Her proposal was met with great enthusiasm, and quickly a committee on organization was established, its membership drawn from the two clubs. According to a 1951 history of the Women’s Civic Improvement League written by Kalamazoo College history student Dolores Matheny, “These women met and decided upon a federated organization, whereby women’s organizations were members and would send two delegate representatives to the governing body of the League.” From the outset, men were permitted membership as associate members and children’s groups were welcomed at reduced rates. The Outdoor Art Committee organized a citywide beautification campaign for spring and summer 1904, making a special effort to interest children as well as adults in the effort. The General Welfare Committee took up an effort begun in 1894 to organize all of the local charities, and effectively established a sort of “clearing house for all charity offered in the city.”13 A secretary was hired, and requests for support began pouring in. From the very beginning, League policies were flexible and responsive to community needs. Soon the League developed a voice in local and national politics, endorsing the anti-cigarette bill petition, and promoting civil service and child labor reform, as well as training for physically disabled children. The Kalamazoo community was kept informed of the League’s stances and undertakings through a bi-weekly newspaper column in the Kalamazoo Gazette. Caroline and Augustus raised their children in a home on South Rose street in downtown Kalamazoo, and enjoyed seasonal interludes to the home they built on Gull Lake Island. In 1924, Caroline made not only national, but international news after her entry in the “Better Homes in America” contest took first prize, earning her commendations from Herbert Hoover and sitting President Calvin Coolidge. Caroline’s entry was hardly a simple sketch on paper - it was, in fact, a house. She designed and facilitated the erection of the “Everyman’s House” in Kalamazoo’s Westnedge Hill neighborhood, where it still stands today. Her concept was novel, dictating that home design should be based around the needs of the mother, specifically the mother caring for small children while also tending to her housekeeping. Caroline died at age 76 on March 24th, 1935, in Kalamazoo - her home of more than four decades. Her husband, Augustus, died two years later, also in Kalamazoo. Caroline and Augustus were survived by their children, Bart and Judy. Both children married, and Bart and his wife, Mary Alice, had two children: Julia “Julie” Bartlett Crane (later Durham) and William Augustus “Gus” Crane. After the war, Bart resumed his work as a surgeon and experimented at home with an x-ray machine. Unbeknownst to Bart, his experiments would have lethal long term consequences; while tinkering, he inadvertently exposed both of his children (and likely himself) to harmful x-rays. As a result, both Gus and Julie would die of brain tumors before their 65th birthdays - a cruel and often overlooked inheritance of their grandfather’s pioneering medical research and their father’s extension of it.19 Descendants of Caroline and Augustus remain in the Kalamazoo area to this day. Caroline’s vision for the Women’s Civic Improvement League and the work she put into establishing it are both honored - consciously or not - each and every day that the 116-year-old organization, now Family & Children Services, operates, making a positive difference in the lives of those it serves. We invite you to share your own F&CS stories and experiences, and we welcome your ideas about which aspects of our history warrant special attention. 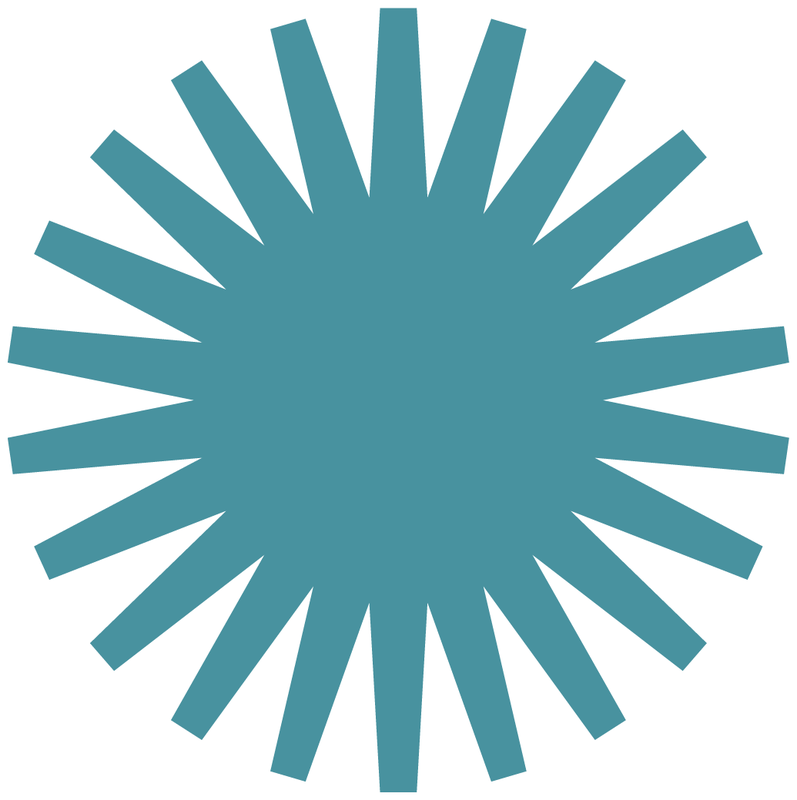 Please contact F&CS volunteer and project lead Mary Brigid Corcoran at mbcorcoran@gmail.com or 917-617-2422. 9 “Germs in Meat.” Detroit Free Press. 20 Mar 1903. Caroline Bartlett Crane Collection, Western Michigan University Archives and Regional History Collections, Zhang Legacy Collections Center. Kalamazoo, MI. Durham, Sidney. Family Interview for Family & Children Services history (phone). 25 Jan 2019. Fugate, Sandy. Edited by Joel J. Orosz. For the Benefit of All: A History of Philanthropy in Michigan. Published by the W.K. Kellogg Foundation in cooperation with the Council of Michigan Foundations, 1997. Portrait of Caroline J. Bartlett (before her marriage). Undated (pre-1898). Courtesy of the Caroline Bartlett Crane Collection, Western Michigan University Archives and Regional History Collection. 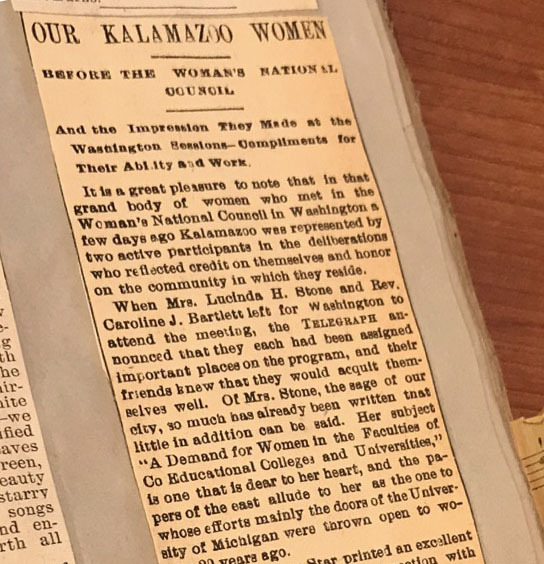 “Our Kalamazoo Women Before the Woman’s National Council and the Impression They Made at the Washington Sessions - Compliments for Their Ability and Work” newspaper clipping. 1891. Courtesy of the Caroline Bartlett Crane Collection, Western Michigan University Archives and Regional History Collection. 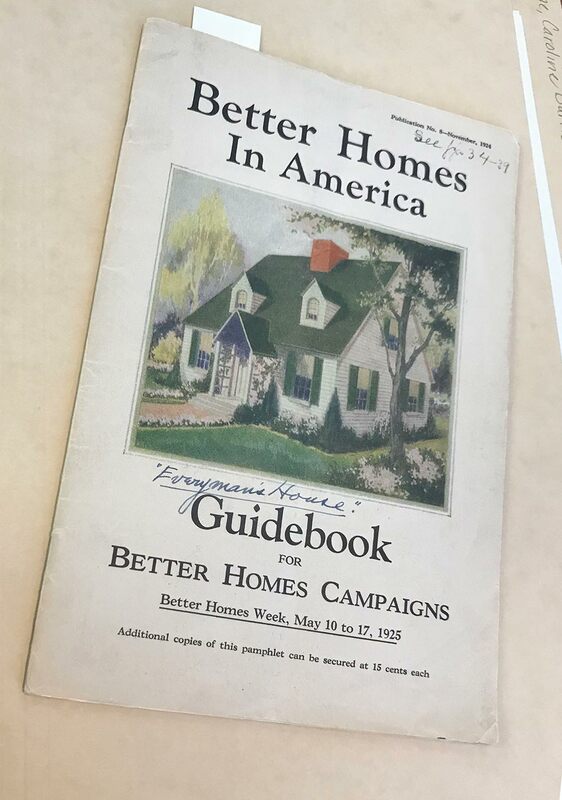 “Better Homes in America Guidebook for Better Homes Campaigns.” 1925. Courtesy of the Caroline Bartlett Crane Collection, Western Michigan University Archives and Regional History Collection.